Firstly, all parts should be checked whether there is leakage after the tires have been inflated strictly according to standards of tire inflation, what’s more, tire pressure must be inspected regularly to ensure that it conforms to criterion. Barometer rather than naked eyes is the normal tool to measure atmospheric pressure. In the process of driving, with particular elasticity, the tires will not deform seriously when bearing normal loading, which can guarantee stability and conformity of concrete mixer. To avoid deflating after a spell, atmospheric pressure of spare wheel should be very sufficient. Secondly, appropriate selection and installation of tires are very important. Tires installed in a concrete mixer should have same brand, structure, figure, and specification, or at least tires on the same axle should be identical. When changing tires, the new tires should be installed on the front wheel, and the repaired tires, which cannot be used as steering wheel to ensure traffic safety, should be fitted on the rear wheels. Thirdly, tires should be transposed periodically. After a period of driving, differences of fatigue and attrition rate between front tires and rear tires will be obvious, which means that they should be transposed as prescribed. 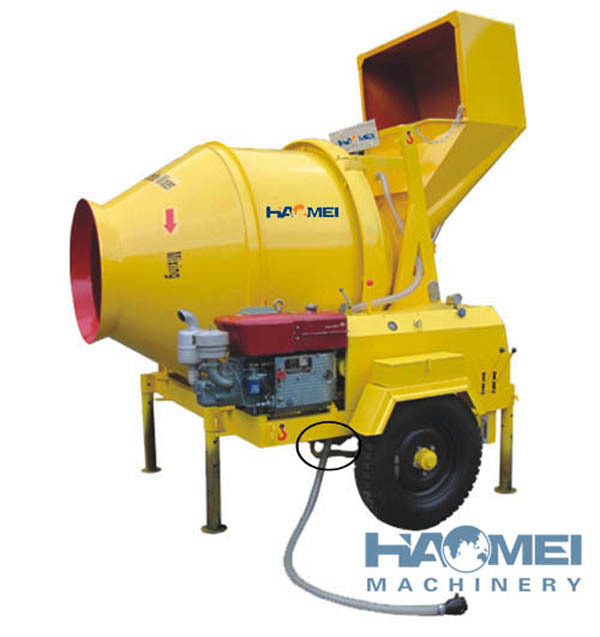 There are two ways: one is interior extrapolation method which can be adopted by concrete mixers running frequently on vaulted roads; the other is circulatory method which is generally used by concrete mixers that often run through even roads.